Good Luck with the project! Hope to visit you guys soon! Well done!! you got a very good website. very interesting work! all the best for successful completion!! Great undertaking , congratulation Pushkar, I like the motto – “responsible tourism” n the simplicity to blend with the surroundings, keep it that way, n cheers. Thank you Prem Dai. See you in Gorkha in couple of months. seems very good project with promising tourism prospects… good luck. A good initiation, best wishes to u all for further step. A wonderful Resort !!! Enjoyed viewing website , Panoramic View of Mt Manaslu…. 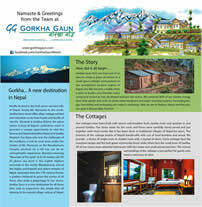 We greatly appreciate your warm hospitality throughout our visit in Gorkha Gaun. Manish, the pasta,chicken curry you made upon our dinner was unforgettable, and Salil / Keshab you and your GG family made our trip very memorable, and we look forward to creating more memories soon. In October 2014 we made a round-trip in Nepal. Luckily we stopped in Gorkha Gaun, one of the most beautiful and peaceful spots we had been in this country. We want to express our`s sincere thanks to Mr. Salil Aryal for his personal interest. Thank you so much for your kind words. It means a lot for our team at Gorkha Gaun. Your stay will always be very memorable to us. I too just visited GG recently, we were very glad with the services and food. Hoping to see soon on my Family Trip.